"It's a fantastic experience because you have the opportunity to attend lectures with famous professors in the area, exchange experiences with other researchers and practitioners in order to form a network. I recommend and I really want to participate in the next editions." "It was an amazing experience, mainly because I knew some interesting people and ideas. This activity was important for my research. The conferences were very innovative." 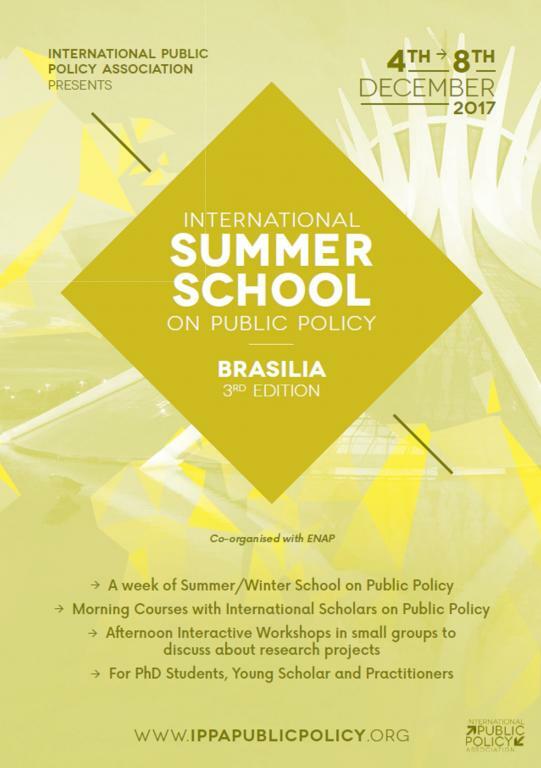 Following the success of the first and second editions of the International Summer School on Public Policy - Brasilia held in November 2016 and May 2017 respectively, the Escola Nacional de Administração Pública (ENAP) and the International Public Policy Association (IPPA) have come together for a third edition. This event will take place from Monday, 4 to Friday, 8 December 2017 in Brasilia (Brazil). The main objective of this International Summer School is to provide advice and knowledge on public policy theories, concepts, and methodologies in policy analysis. Lectures in the morning will alternate with workshops in the afternoon. Four workshops (each composed of a small group of 20 students maximum) will be conducted by an internationally renowned scholar. One group will be composed of Ph.D. students and young researchers and two groups will be exclusively composed of policy practitioners. The application and selection of Ph.D. students and young scholars (less than 3 years after obtaining their Ph.D.) for the Summer School will be managed by IPPA. All relevant information will be available on this page. The selection of policy practitioners will be managed directly by ENAP and all the relevant information will also be available on this page. Charlotte Halpern holds a Ph.D. in political science and is an FNSP Associate Research Professor (full tenure) at Sciences Po, Centre d’études européennes et de politique comparée (CEE), CNRS, France. She teaches courses on public policy analysis, comparative urban governance and EU policy-making. She has undertaken extensive research on state restructuring, policy change and the selection of policy instruments, mainly in the field of environmental, transport and infrastructure policies in Europe and South America. Her current research includes CREATE, a European-funded project (under Horizon 2020) on "Congestion reduction in Europe", SYRACUSE, a project funded by the French National Research Agency on "Networked symbioses adapted to sustainability-oriented urban contexts" and MEGOWAS on the "Metropolitan governance of water systems" (funded under USPC-NUS joint research projects). She has co-edited several books (e.g., Policy analysis in France, Policy press, 2018 with P. Hassenteufel and P. Zittoun; Policy instrumentation, Presses de Sciences Po, 2014 with P. Lascoumes and P. Le Galès), special issues and articles in academic journals (Comparative European Politics; West European Politics; Politique européenne; Espacestemps.net) and chapters in peer-reviewed books. She is the scientific director of the Sciences Po Urban school’s Master program “Stratégies territoriales et urbaines” and of the Double Degree “Urban policies” with the London School of Economics. Guy Peters earned his Ph.D. from Michigan State University. He is currently the Maurice Falk Professor of American Government at the University of Pittsburgh. Dr. Peters has also served as a research professor at the University Center for International Studies (UCIS), a senior fellow at the Canadian Centre for Management Development, and honorary professor at City University of Hong Kong. He currently teaches courses on public policy and American and comparative politics. His research focuses on public policy and administration and American administration policy. He is the author or editor of over 60 books in political science, and a founding editor of the European Political Science Review and of Governance. He has been a guest professor in universities in almost every country in Europe and a number in Latin America and Asia. M. Ramesh is Professor of Public Policy at the National University of Singapore. Previously, he served as the Chair Professor of Governance and Public Policy at the Hong Kong Institute of Education, Professor of Social Policy at the University of Hong Kong, and Chair of the Department of Government at the University of Sydney. Specializing in public policy and governance in Asia with a particular focus on social policy, Ramesh has authored and edited many books. His co-authored book "Studying Public Policy" has been translated into many languages including Portuguese (Política pública seus ciclos e subsistemas). His books and journal articles on social policy in Asia are the standard starting points for research on the subject. He is the founding Editor of the journal Policy and Society and serves on the editorial board of several reputed journals. Moreover, he has served as consultant to prominent international organizations, in addition to serving International Public Policy Association and other international professional organizations in an executive capacity. Philippe Zittoun is research Professor of political science at the LAET-ENTPE of the University of Lyon and the General Secretary of the International Public Policy Association (IPPA). He is co-editor of the International Series on Public Policy for Palgrave-McMillan and serves on the Editorial board of many scientific journals (Critical Policy Studies, Journal of Comparative Policy Analysis, Policy Studies Journal, Policy and Society, Policy Research Journal, etc.). He has been a visiting Professor at Yale University and has given lectures in different universities around the World. He has published 7 books and a large number of articles. His most recent books include "The Political Process of Policymaking, a pragmatic approach to public policy" (Palgrave 2014), "The Contemporary Approaches to Public Policy: Theories, Controversies, and Perspectives (Palgrave, 2016) (with Guy Peters), and Policy Analysis in France (Policy Press, 2018). His studies focus on a constructivist and pragmatist approach to policymaking. Policymaking involves designing the interventions of the public sector intended to correct policy problems. This course will discuss the development of thinking about policy design and the components of design (problems, instruments, evaluation, and intervention). Some attention will be paid to addressing complex and "wicked" problems, and to emerging ideas about designing. This course is proposed by Philippe Zittoun and is based on his book "The Political Process of Policymaking". Its key objective is to explore and discuss how one can grasp the political dimension of the policy process by observing the struggles around problem definitions and their solutions. It will pay special attention to the building of coalitions and to the powerful dimensions and different challenges solutions encounter on their path. Why do some solutions succeed in emerging in decision-making processes while others fail? Under which conditions and at what price do solutions emerge on the solution agenda? How do some actors succeed in "domesticating" "wicked" problems? Policy coordination - across policy domains, across levels of governments - constitutes a major challenge for policy analysts as well as for practitioners. Yet public policies are usually discussed one by one, and in practice, policy coordination is often extremely difficult to achieve. Drawing on the methods and tools available in the public policy literature, as well as on specific case studies, this course will examine the reasons for promoting greater coordination, highlight the barriers preventing such coordination, and explore the various mechanisms through which policy coordination may contribute to more effective political capacities. The objective of the course will be to introduce participants to the theory and practice of Public Policy Design. It will begin with a discussion of the concept and challenges of policy design. Next, it will discuss the process of policy design: understanding and defining the policy problem, surveying the range of tools available to address the defined problem and assessing the appropriateness of the tools against technical, political, operational, and capacity criteria. Finally, it will discuss how to apply policy design in the formulation, implementation, and evaluation of policies. Lectures will be complemented by case study discussions during workshops. As a Ph.D. student or young scholar, you're working on a research project. The Summer School Program provides you with an opportunity to present and discuss your project within a small group. This is the best way to explore and test your research problem, your methodology, and your hypothesis. Each participant will receive approximately 30 to 45 minutes to present his or her project which will then be discussed by an international scholar and by other Ph.D. students participating in the group. Consequently, participants will discuss each other's projects during the research workshops. The interaction between participants around research projects is pedagogically relevant as it makes it possible to increase awareness of significant scientific schools of thought on public policy and to clarify conceptual assumptions and empirical approaches in their research. This has an impact on the originality and innovativeness of participants' research and helps them gain knowledge on concept, approaches and methodological issues which help incorporate an international aspect to each project. The application and selection of Ph.D. students and young scholars (less than three years after obtaining their Ph.D.) for the Summer School is based on the research project proposed by the students and young scholars. The research question. What issues does the project seek to highlight and why? These could be theoretical research questions or methodological questions. In what context do these issues occur? The proposal should present the context in which these issues are found and justify why, taking into account this context, the issue is relevant. What is the scientific relevance of the research question? The document should present a brief state-of-the-art and identify specific expected contributions and the approaches and concepts mobilized. What will the research project contribute to existing studies? What kind of hypotheses does the project explore? Why are these original and how will they help highlight different aspects of the main research question? The number of places is limited to a maximum of 35 Ph.D. students and early-career researchers. Applications will be accepted from the 1st to 30th September 2017 (extended deadline - 20th October 2017 !). Results will be published end of October 2017. 4) Specify your preference between the 2 courses open to PhD students. The Summer School is free but participants must cover travel and accommodation costs. The International Summer School on Public Policy, Brasilia 2017, will be held from the 4th to the 8th December at Escola Nacional de Administração Pública (ENAP) located at SPO - Asa Sul, Brasília - DF, 70610-900, Brazil. The nearest hotels are located around the Setor Hoteleiro Sul/Norte area which is 8 to 10 km away. Participants attending the Summer School can also choose from a wide variety of accommodation including hotels, hostels, and guest rooms. We highly recommend that you compare possible accommodation on online hotel reservation platforms (Booking, Hotels, Agoda, TripAdvisor, etc.) before booking as significant differences sometimes exist in the rates proposed across these platforms. A shuttle bus between the Setor Hoteleiro Sul/Norte area and ENAP will be available. *Please, note that all rates indicated are for 4 nights.